MDirect is a discount broker based out of Mumbai. 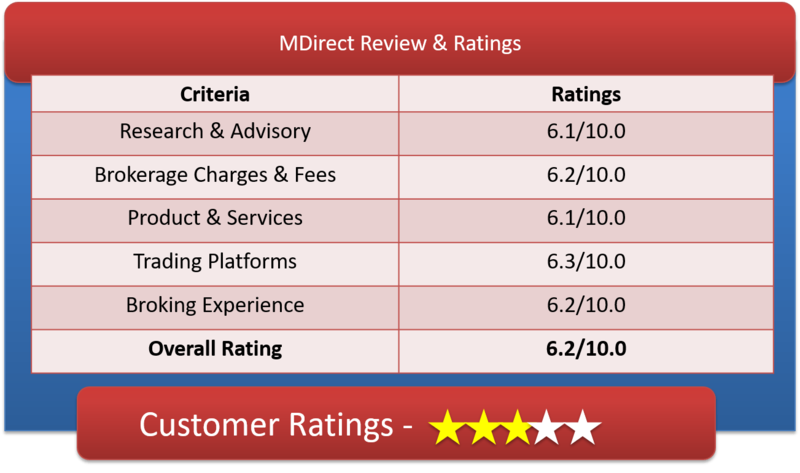 Lets have a detailed review & understanding of MDirect Demat Account, MDirect Brokerage Charges, Moneylicious Capital Trading Platforms & other important features. MDirect is an online trading broker for trading through Moneylicious Capital & Advisory Services Pvt. Ltd. M Direct is Mumbai-based new entrant into Discount Broker Industry. It has membership in BSE, NSE, MCX, NCDEX and MSEI. M Direct offers trading in equity derivatives (F&O), equity delivery, equity intraday, currency and Commodity segments at a very cheaper and affordable flat fee of Rs 18 per executed order. MDirect Broker provides easy-to-use platform for trading and complementing the same by delivering stock and commodity specific research reports to your email ids on daily basis. With Moneylicious Capital you can view your trade, transfer fund and manage your Portfolio, all on a single screen itself. Customer Care is available through email, toll free no, phone, online feedback, online message. It looks satisfactory not the best though. Mdirect Brokerage is competitive and straight forward. No platform or hidden fees. The rates are all inclusive. M Direct offers their clients brokerage of Rs 18 per executed order plan across all segments. Client pays flat Rs 18 per executed order irrespective to the size of the order. Call and trade facility is available at an additional charge of Rs 18 per executed order. So if you place order by phone it will cost you 18 for call and trade + 18 as brokerage. Moneylicious Capital offers brokerage of Rs 18 flat-rate share trades are higher than ProStocks (Rs 15), SASOnline (Rs 9) & RK Global (Rs 9), Wisdom Capital (Rs 9),My Value Trade(10 Rs),Trade Smart Online (15 Rs) and lower than Zerodha (Rs 20),RKSV (Rs 20),Tradejini (Rs 20) plans. Why Open MDirect Demat Account? E-KYC to be introduce soon. Offers flat brokerage @ Rs 18 per executed order across all segments and exchanges. Intraday and Positional Calls through SMS. Clients can trade with M Direct using Omnesys NEST platform which is available in desktop, web and mobile versions. Omnesys NEST platform is a fully functional trading terminal allowing fast execution of your orders with real time monitoring and no lag in between. Moneylicious Capital NEST Plus is a desktop base installable trading platform by “Omnesys NEST”. Advance charting tools for technical analysis, option trading strategies, live quotes, market Analysis, real-time news from Dow Jones, market monitor and scanner makes up the bulk of this platforms offering. With this you can trade all segments and exchanges on a single platform. M Direct NEST Plus is also available in web version which works on any available web browser, no need to install or download anything software. The web address for this is Mdirect.co.in. The app is available for both operating system android and IOS users. Use it for real time feed and to track orders and positions on the go. MDirect is the discount broker with a little difference. M direct is charging as a discount broker but providing research reports and tips just as full service broker only lacking behind in tools and technological advances. Moneylicious Capital can be a good bet for beginners in stock market as they provide research and tips at a reasonable rate. Workshops/ seminars/ webinars to educate traders. Multiple Segments and Exchanges on same trading Window.